Image centre is located at 19:29:11.8, +5:14:41 (H:M:S, D:M:S, J2000) Astrometric data from Astrometry.net. Aquila (the Eagle) well represents a mythological bird that was the companion of Jupiter. It lies in the northern Milky Way and contans rich fields of stars particularly in the western half and into adjoining Scutum. 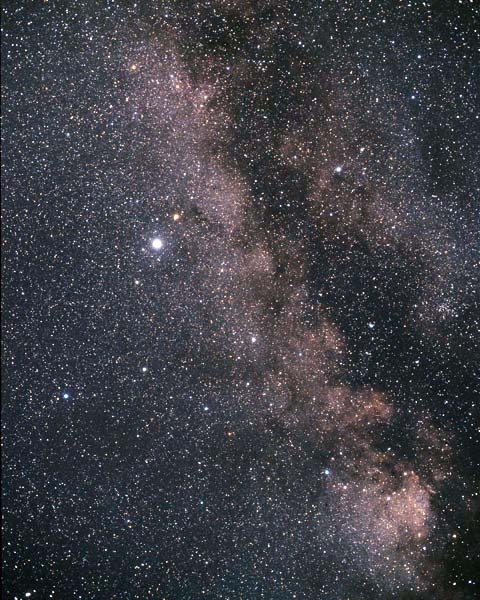 The brightest star in the constellation is Altair (Arabic for flying eagle), which is at one corner of the Summer Triangle (Altair, Deneb and Vega). Sagitta (the Arrow) is the third smallest constellation in the sky, and although it contains no bright stars, was well known to the ancient Greeks. Its arrow seems directed through Vulpecula and Pegasus towards Andromeda, skirting Cygnus. A rather better (though incomplete) view of the constellation is here, and its brightest stars are best seen on the page about Delphinus. There's more about Sagitta in Wikipedia. Both these constellations are a little north of the celestial equator and can be seen from all inhabited parts of the planet. Constellations adjoining Sagitta: Aquila, Delphinus, Hercules, Vulpecula. Altair (α Aql), Al Thalimain (λ Aql), Alshain (β Aql), Bezek (η Aql), Deneb al Okab (Denebokab Australis, ζ Aql), Denebokab (δ Aql), Sham (Alsahm, α Sge), Tarazed (γ Aql).